Twitter recently launched election twitter to keep up with the political discussion and now Microsoft Live Labs came up with Political Streams, sort of meme tracker. 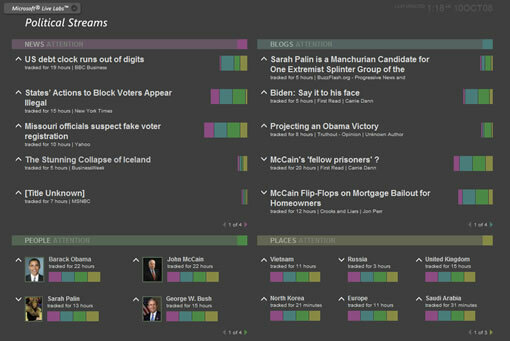 Political streams tracks news stories from blogs and media sites and ranks them. Political Streams is an application which mines social media content in real time for political discussion. It surfaces the news articles and documents that are being discussed as well as the people and places that appear in those articles. In addition, it provides related information for any news article, weblog post, person or place. This related information gives a broader context, allowing the user to understand how both the mainstream and social media are discussing an issue, person or place. The posts are ranked based on the links to blog posts or news articles and they are displayed on the home page based on ranking. Interestingly it also gives information about people and places in the news. This information is extracted from Freebase, an open database of information. Clicking on any article on the front page takes you to the article page where it displays snippet of the original article and a link to full article. Below the articles you can see the people and places graphs. As Webware points out this meme tracker is just for election or will it extend to other areas like tech, celebrity news, sports etc?.